Situated 800' off Gorham, the long driveway is a special treat. 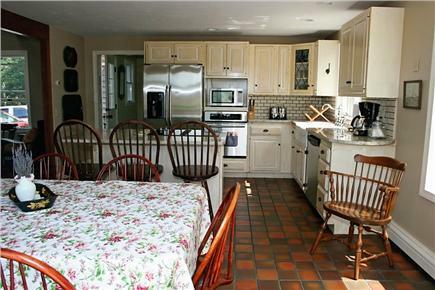 Roomy dining area and kitchen allow optimal family time. Updated Kitchen with granite countertops and new appliances. Master Bedroom with King Bed and access to outside deck. Second Master Bedroom, Upstairs w/King Bed and separate bath. 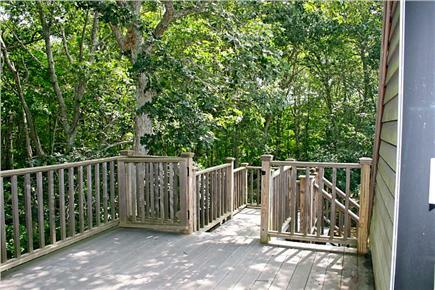 Serene private Upstairs Deck off Master Bedroom. 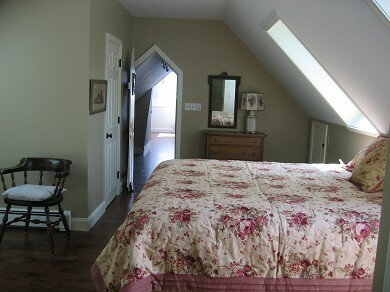 View of large upstairs bedroom containing 5 twin beds. The warmth of home will envelope you as you arrive. Enjoy a picturesque atmosphere while the kids play volleyball. 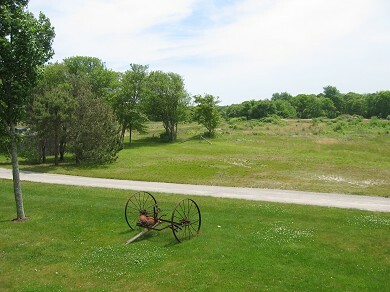 View of Cranberry Bog and Harwich Conservation Trust property. 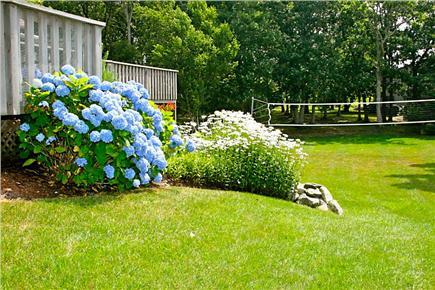 Located just off of Bank Street in Harwichport, enjoy the privacy offered by the surrounding cranberry bog and natural tree grove while being only minutes from shopping, dining, family activities and the Bank Street beach on Nantucket Sound. 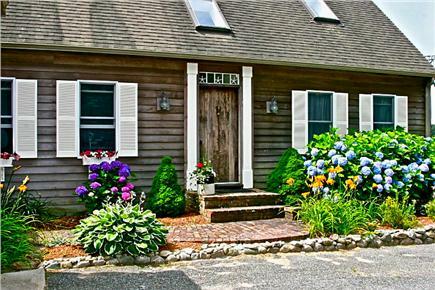 Relax in this recently renovated, charming home complete with an updated kitchen and bathrooms. Rejuvenate on the large, leisurely deck across the back or cozy-up with a book on the secluded deck upstairs. Play video games in the upstairs loft or, settle in for a great movie or ballgame on TV in the enchanting living area downstairs. Take in the fresh air as you walk or bike approx. 1 mile to Bank Street beach. 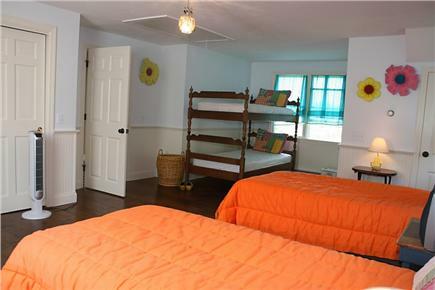 To complete your Cape vacation, refresh in the outdoor shower after a full day at the beach, hiking/biking on the trail or treasure hunting in the quaint village shops.With an upstairs and downstairs master bedroom this home is ideal for two families to share. 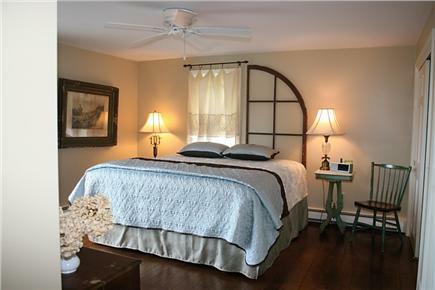 All the rooms are spacious and enjoy views of he cranberry bog or surrounding land. Additional availability info: Check-in 3:00 pm, Check-out 10:00 am. This is a Saturday to Saturday vacation rental. 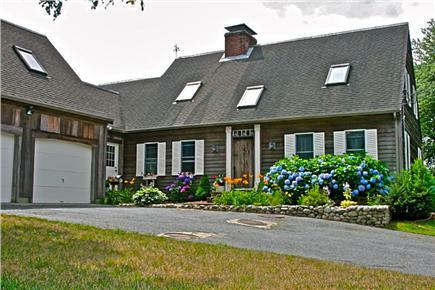 Additional pricing info: Great Gorham Rd. location! 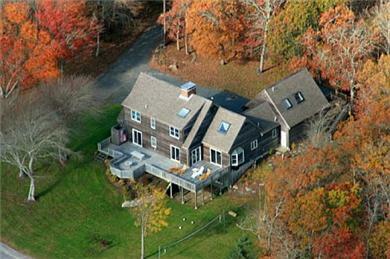 Privacy yet close to Beaches & Main Street. Reserve today. State and local taxes of 12.45% will apply. Our extended family gathered at Cranberry Cove for the third time! Needless to say, we think it's a great spot to stay. 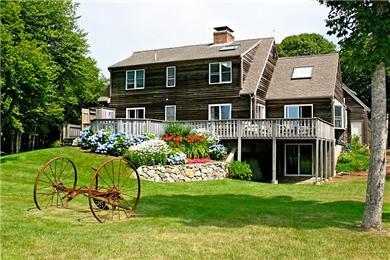 Close to food, entertainment, beaches, walking and biking trails. Lots of time spent on the enormous deck lounging and for family dinners. Owners are very attentive and a pleasure to deal with. Location is very quiet and private. Just love it and will return again. We had a wonderful family vacation at the bog house. 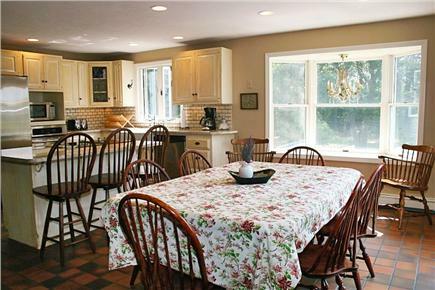 This house is very spacious and charming and you can't beat the setting! We enjoyed many long walks, dinners on the deck and card games at the kitchen table. And Isabel (11 mos.) worked on perfecting her walking skills all across the back yard. Thanks again! Alex T and Terry W Famil ! We had a wonderful vacation with family and extended family. Your home was perfect! It is so spacious and very charming. We enjoyed the beaches, bike trail, deck and yard. We are leaving with many wonderful memories - Thank you! We had a lovely vacation at the bog house, with our extended family. Everyone enjoyed the swimming, fishing, walking the bogs and running on the trails. The house is great and we hope to come again. We vacationed at the bog house in Julyy 2011 for two weeks with our extended family. Everything was perfect - from the morning runs around the bog to the long family dinners on the deck. Thank you so much for your wonderful house; it is warm and comfortable. You're house is beautiful and we had an amazing time! Our vacation at your house on Cape Cod wonderful. Loved the Cape League baseball! I hope to return again soon - Go Chatham A's! !